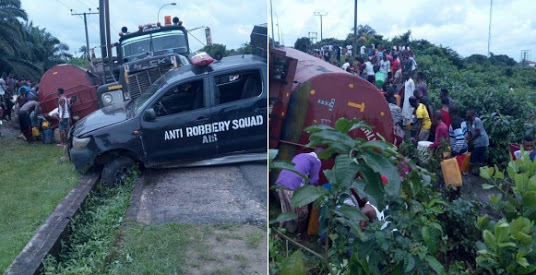 There was pandemonium yesterday after a fuel tanker hit a police vehicle while being chased security operatives in Akwa Ibom state. The police officers from anti-robbery division chased the tanker driver and blocked him off at Uyo village road by Calabar-Itu highway. The driver will sure pass through a lot in the hands of the police.